This safety gate uses the same 11-gauge triple rail system and bolt-hole spacing as our medium duty guardrail (Steel King Armor Guard). 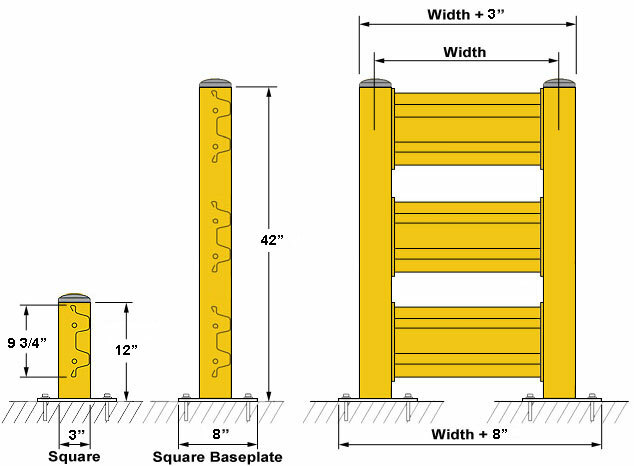 The gate can either be used as part of a new installation or retrofitted into an existing system between posts with 48" spacing center-to-center (41.5" clearance when open). It opens a full 90 degrees and has a self closing hinge on one side and two gate stops on the other that can be reversed so that it can be installed as right-hand open or left-hand open. Installation is quick and easy when matched with Armor Guard medium duty posts and requires no drilling, cutting or welding. 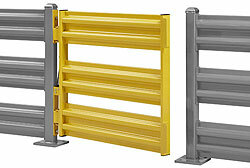 What do I need to know to order Steel King Armor Guard Rails? Guardrails are measured from post centers, not rail length. They have 3" posts and 8" x 8" footplates for impact resistance, which means your 48" of space will not accomodate a 4' rail. 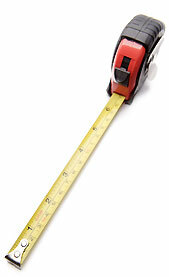 Use the largest rail size smaller than your defined area. (Armor Guard comes in 1' increments), which is a 3' rail. Rails are actually 3" short of their listed length since Armor Guard is measured center to center of posts. Now, add your rail size to 8" (for the footplates) on both ends. The length of your guard rail is actually center-to-center listed length plus 8", from the outer edge of each foot plate. This rail will cover 48". It's 44" total, which will comfortably guard the 48" space you need. To simplify it, take your needed coverage space, subtract 8" and use the rail size less than that. This should be accurate most every time. Your floor should be level (can be shimmed if not in most circumstances) and capable of accepting anchor bolts. Post Specs: 3" x 3" square with 8" x 8" footplates. Heights: Triple rails are 42" tall (42-5/8” tall with post caps). Single rails: 12" tall (12-5/8” tall with post caps). Preconfigured solutions: The guardrails on Cisco-Eagle.com are listed as components so you can build your desired solution, but also in starter/adders, so you can marry a 10' starter with a 5' adder to cover 15' if desired, with ease. These can turn corners or install in a straight line. Posts are drilled on all sides so you can use them as starters or adders, in centers or corners. Should I use triple or single high? Triple rails are 42" high and prevent people from stepping over them if you are using the system as impact protection and traffic management. Sometimes forklifts can still hit something behind a single high rail in the wrong circumstances. In areas where you are protecting critical machinery, expensive inventory or work cells, you should also specify triple high.